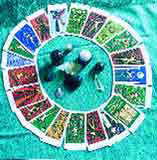 Tarot has 22 major cards and 56 minor cards. Major ones speak of the ‘why’ of things and minor ones tell you what is happening. Familiarize yourself with the cards. Concentrate on the question and shuffle the cards. ‘The question should be simply framed,’ advises Guneeta Dhingra a tarot reader. There are various layouts but Guneeta prefers the seven-card layout. Question: Am I likely to get a satisfactory job in the next six months?First Card: Represents the situation from the last 18 months up to the present moment. Here a page of swords depicts dreams but not enough action. Second Card: Present situation. An eight of pentacles signifies commitment to the present situation. Third Card: Next six months. A ten of cups, reversed, stands for the lesson in the previous card not having been learnt. In a work situation, it indicates a harmonious group in the past but in a competitive mood now. Fourth Card: Part of the answer. Eight of wands here indicates a positive response. Fifth Card: Energy surrounding the questioner. King of cups reversed indicates discipline can bring rewards. Sixth Card: Hopes and fears. A major card. Temperance indicates the need to reacquaint yourself with your purpose before you embark on any course of action. Seventh Card: The outcome. The emperor signifies that a disciplined approach will lead to success. Any recurring number portends an important event. A dice on top of another is a warning sign. Avoid Mondays and bad weather. The art of reading tea-leaves is probably the simplest means of divination. There is a specific ritual to be followed. Use a cup with a wide mouth with white inside devoid of any pattern. It’s best to use china leaf tea. The inquirer drinks from the cup till about one teaspoon of the liquid is left. In the left hand, move the cup three times clockwise and anti-clockwise, concentrating on the question. With the right hand, invert the cup on a saucer and drain the liquid. Now look at the tea-leaves in the cup. At first, it appears to be a dismal scene. But observing closely, you can glean pictures and symbols. The handle of the cup represents the inquirer. The position of the symbols represent timing of events. If they appear near the rim of the cup, the events are at hand, while those portrayed on the sides stand for delay, and those at the bottom pertain to remoteness. See the size also—a large one indicates large legacy and small one, small legacy. But limit your questions to once or twice a week. Often, the capricious turns of time put you in circumstances where you are forced to wonder if you can really control your destiny. Perhaps it never hit me as strong as it did when I woke up, suffocated by a world of darkness, writhing in pain. I was the victim of an accident, somebody told me. Legs, arms and face smashed. I may lose my right arm, diagnosed the doctors. Maimed for life. ‘WHY ME?’ my heart cried out. Silence. Six months later, I walked out on crutches, stumbling, trying to maintain my balance with my left hand, right arm still encased in plaster. Leaning against the pillar I looked at the books on the pavement store. A-Z of Astrology by Mahavir Tuli. Maybe this would tell me why this accident had to happen to me. In times of need, astrology indeed. Or perhaps numbers. Each of us has a personal number, which creates harmony or disharmony, claim experts. Or you could study the lines on your palm and try to foresee your future, all with the help of a book on palmistry. You could even opt for tea-leaves, tarot cards, handwriting, or even the ubiquitous dice. But is time a straight chain of events with everything predestined? If not, then how much is fated and how much depends on the choices we make? And to what extent do predictive sciences really predict the future? But do these timeworn systems actually work? ‘Our predic foretelltions come true, so we can say that they work. But, yes, they are based on desh (place), kaal (time) and patra (individual).’ Each individual has to be given separate counsel. The birth horoscope is a basic tool of astrology. It is a map of the solar system at the exact time of birth. Astrology explores ways in which we share traits with cosmological patterns and regularities through our ascendant and moon signs. Ascendant is the zodiac sign arising at the time of birth and moon sign is the sign in which the moon is placed at the time of birth. These two form the basis of all Vedic astrological predictions. In different parts of India, different systems are used. ‘Despite certain differences, there are similar trends of analyzing the horoscopes,’ acknowledge both Rao and Gayatri who work with Vedic astrology. But western astrology takes into account the sun sign, the placement of sun in the birth horoscope. Differences arise here. However, Mohinder Chopra, USA-based astrologer, has combined certain western techniques with Vedic astrology to ‘improve accuracy’. But both Nirmala and Chopra claim Vedic astrology to be superior to any system. According to Rao and Gayatri, we also need to modify the classical interpretations to suit the needs of today. Rao condemns irrational beliefs. ‘As astrology is an unlicensed profession, it is an invitation to many frauds. Incomplete knowledge can be harmful.’ Agrees Nirmala: ‘This is an enlightened science and we should be extremely cautious in its use or abuse. The common man is unaware of the fact that the predictor has to bear the load of the client’s karma.’ She suggests that astrology be included in university curriculum ‘so that people can utilize it to lead better lives’. Yet again, Edamaruku flays these institutes and their claim to scientific basis: ‘Pure charlatans. I have studied astrology, but all to no avail.’ His organization has been trying to eradicate superstitions since 1949 and all these ‘predictive systems are only superstitions’. The karma theory is central to Hindu philosophy. Writes Rao in Karma and Rebirth in Hindu Astrology: ‘Karmas are of four types—sanchita (accumulated from the past), prarabdha (those allotted for present birth), kriyaman (those we do in the present life) and aagami (stock for future lives).’ Yet again, Edamaruku takes a different stance. ‘There is no life after death. Life is like a candle, burning slowly. Once the wick finishes, the candle burns out. Similarly, once the breath ceases, life ends. We are influenced by the cosmos purely by the environmental factor,’ he avers. Now what is the scope of free will. Astrologers broadly define it as the area of existence where we are free to perform actions. But these actions too are within the limits set by destiny, which again is determined by our karmas. ‘Astrology is like a video we choose to put in the cosmic tape deck of our karmic psyche patterns for the present life,’ says Jai Maharaj. Back to square one. Visions bright and beautiful. What do they foretell? We’re talking about tarot, an ancient art traced to the gypsies. ‘These cards are a means of divination and a tool for understanding yourself,’ explains Guneeta. It is an attempt to forecast the future through the interpretation of messages from God, other spiritual beings or perhaps from future itself. ‘It is a language of the soul. It is more a psychological tool than a mysterious fortune telling game,’ she adds. ‘It gives us an uncanny ability to see into ourselves.’ However, Maria Weber, a Polish tarot enthusiast, says that she picks up whatever she predicts from the client. Besides these, nadi or nerves in our body too speak volumes about our lives. Not only is it part of the nervous system, it also sends out vibrations, claims R. Mani, nadi expert and mantra healer. Mani has developed this art with siddhi, regular recitation of a mantra to please a particular deity. Sitting with his hand on your pulse, he concentrates on the vibrations and voila! all the answers are there. Then Mani recommends mantras and gives vibhuti to remove all negativity. Rational or irrational, these systems remain as popular as ever, scientific temperament of the times notwithstanding. What has changed is the use of hi-tech: computerized horoscopes, astrology websites, readings and consultations on the phone. Wrote Mukul Sharma in a daily newspaper: ‘The forecasts are a staple diet of newspapers and magazines. I myself have recycled and shuffled them many times. And amazingly, neither the readers nor the forecaster complained.’ So, why all these weekly and monthly columns on zodiac sign forecasts. Because they are so popular and help to increase readership. On this issue, for a change most astrologers and rationalists share the same opinion. Rao, Guneeta and Nirmala dismiss zodiac sign forecasts. Each one of us is an individual, so how can the destinies of millions be matched or grouped as the forecasts claim? That is their argument. Saroj Datt, graphologist, claims that by handwriting analysis she has prevented many mishaps. ‘Handwriting is an expression of your inner self.’ She cites the case of a girl whose symptoms of depression were visible in her handwriting: ‘I could see she was on the verge of committing suicide. So I talked to her and sorted out the problem.’ Isn’t this what many of us are all looking for? Somebody to share our grief with. Then do we need a soothsayer or a soothing touch? For Mukul Sharma, intuitive abilities are valid but ‘when they incorporate it with the mumbo-jumbo of any system, then I disbelieve in it’. Is life so cut and dried that it can be controlled by either astrology or technology? Or do we still need more sages or scientists to unravel the mystery of life and its vicissitudes? Human Figures: If they seem benevolent, then they’re good.